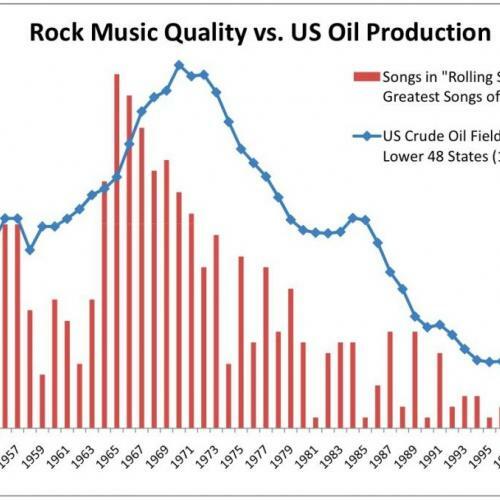 Question: Is the decline in good rock music driving the decline in oil production, or is it vice versa? Economists and aesthetes will debate this for decades, I'm afraid. P.S. Another question: It says on this wiki page that the "Rolling Stone 500 Greatest Songs of All Time" list was chosen "based on votes by 172 musicians, critics, and music industry figures." If that's the case, then it occurs to me that the distribution of songs across years might always look something like this, regardless of when you plot it. That is, it may be that people--particularly insiders and elites--have a bias toward thinking the best music was made 50 years ago. So if you did another 500 greatest songs list in 2054 rather than 2004 (when this one came out), the peak might come some time this decade. (Hard to believe, I know, but just wait till you hear the schlock the kids are listening to in the 2050s...) Meanwhile, I'm guessing that peak oil production is going to stay put right where it is.